There is no place like home! That was what I was thinking when we arrived at our house after our vacation in England in the evening of June, 21st. 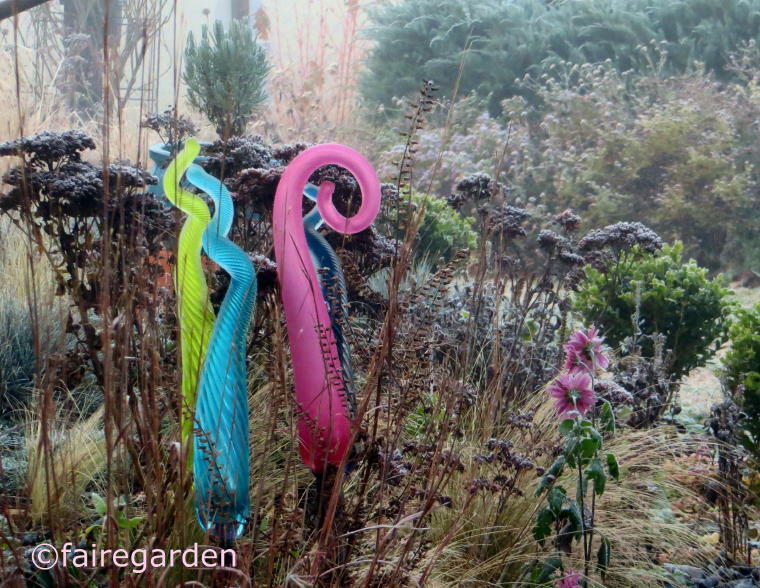 And I was even more happy when I took a closer look at the garden the next day. This year I hired a person to water my garden when we were gone and she did a truly wonderful job. Even though expensive, it was so well worth it. All photos used in this post are taken in the last week of June. Let's have a stroll through parts of the front yard first. This is what I saw when I opened our front door. 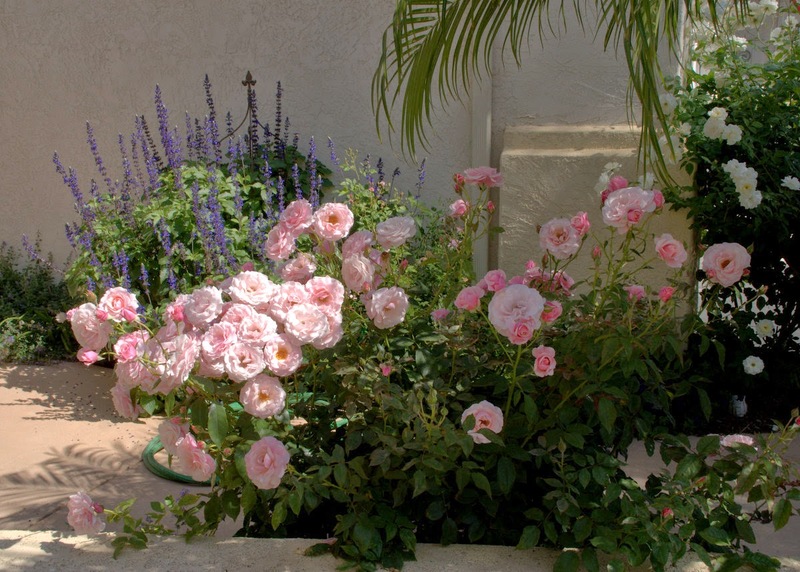 The two light pink roses to the right are 'Our Lady of Guadalupe'. 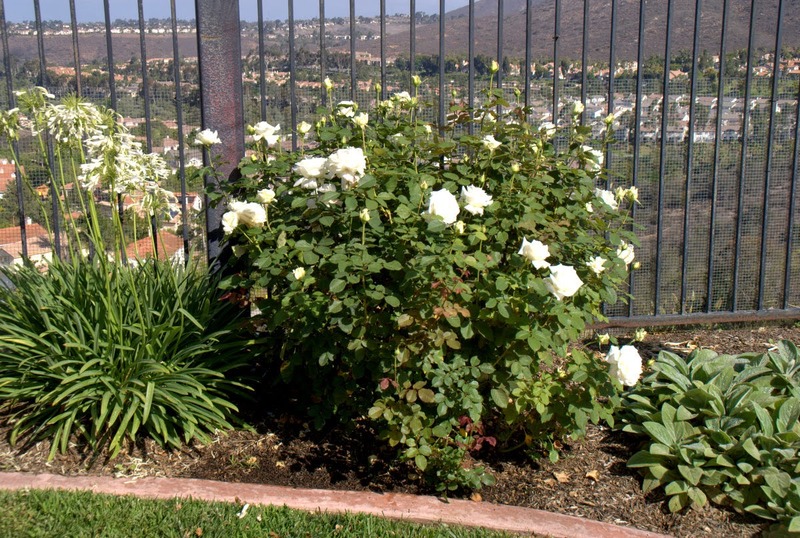 The white one to the left is a 'Climbing Iceberg' rose. The plant with the blue flower spikes is salvia 'Mystic Spires Blue'. Looking back towards the front door of the house. 'Our Lady of Guadalupe' had produced a second flush, that was almost as floriferous as the first one this year. The second flush of the 'Climbing Iceberg' rose also just looked amazing! How my neighbor sees part of the front yard. I have permission to deadhead from her side and it is sometimes interesting and surprising to see our front yard from her property. The rose in the front is 'Our 'Lady of Guadalupe' again, the rose to the right is the 'Climbing Iceberg', that you saw already on previous photos and the blue flowering plant to the left in the background is salvia 'Mystic Spires Blue'. It is hard to guess from the images, but the salvia is more than four feet tall! One rose that resides in the front yard that I like very much is 'Marie Pavie'. She was at the end of her second flush already. Moving on to the backyard. 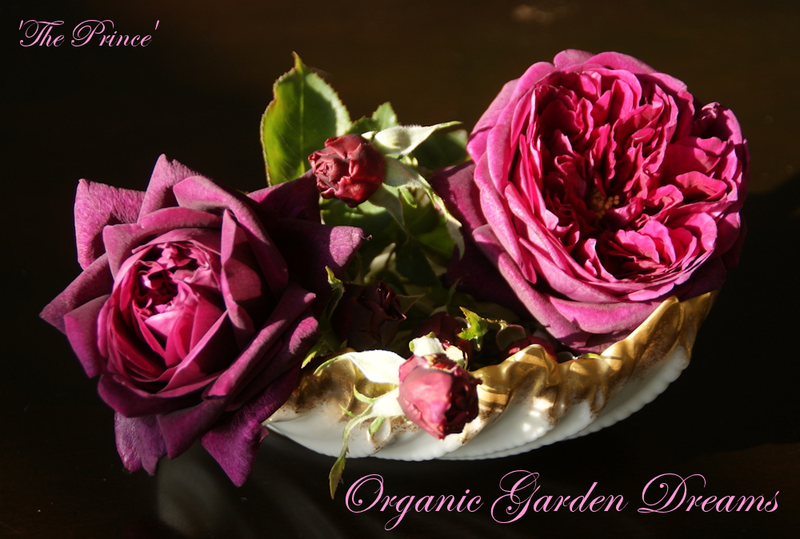 On the image above you see my two 'Charles Darwin' roses. They are wonderful healthy roses in my climate. 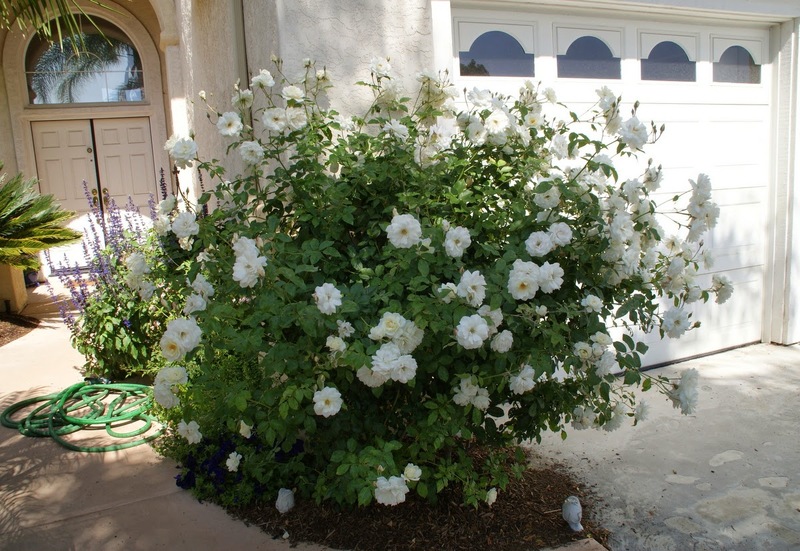 The big cup-shaped blooms are so sumptuous and the roses are producing them very freely. Even though the terracotta containers are quite big, they are too small for these roses in the long run. I need to plant them out into the ground sooner or later. The beauty of the blooms of 'Charles Darwin' never fails to impress me. They are always so elegant. For me 'Charles Darwin' is one of the finest creations that the rose breeder David Austin has bred so far. 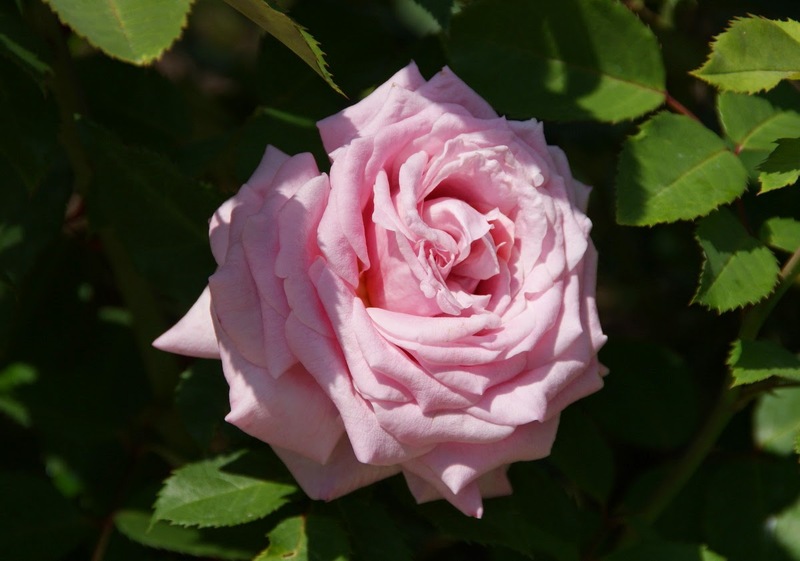 The photo above shows 'Frederic Mistral', a light pink Hybrid Tea rose. It is beautifying our terrace. 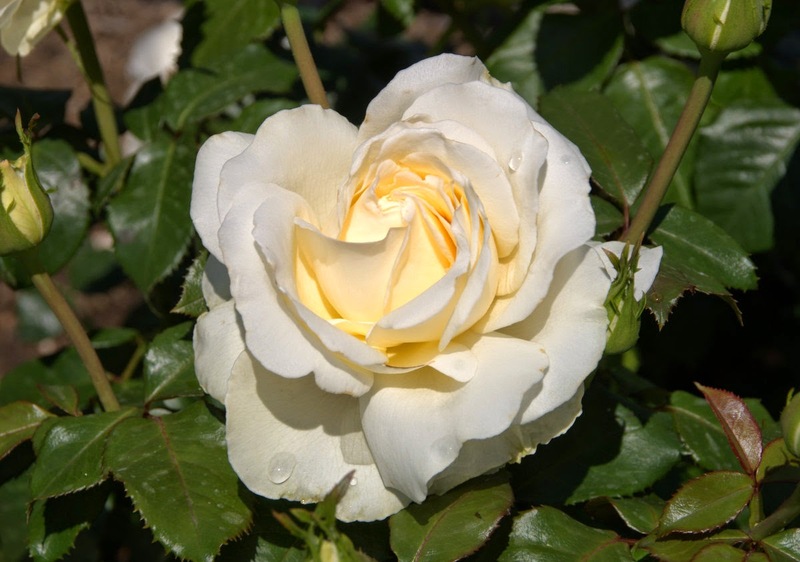 It is very vigorous when watered and fertilized generously and seems to have a good re-bloom. What you see is the second flush of this rose. I am observing its disease resistance, its bloom shape, and the growing habit of the bush. So far 'Frederic Mistral' is relatively healthy, but he can suffer from powdery mildew sometimes. Another rose growing on our terrace is 'Mary Rose'. This one is also bred by David Austin. It has been flowering quite generously, too, and I love the light pink bloom. It repeats well. 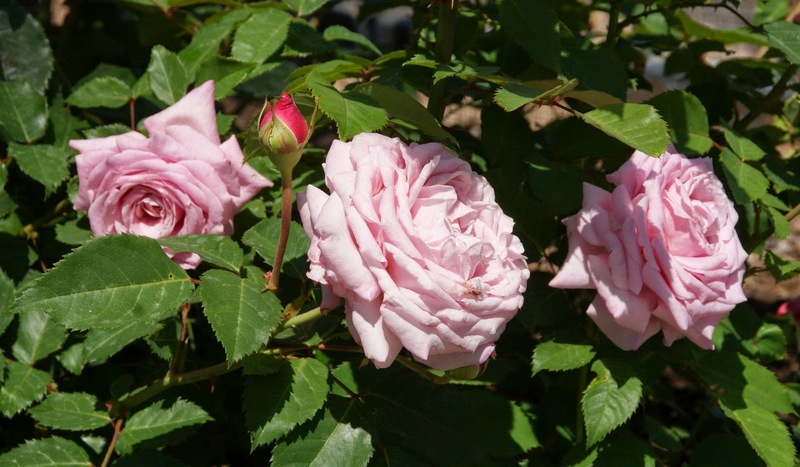 The only drawback is, that it drops its rose petals quickly, so be prepared to do a lot of deadheading! 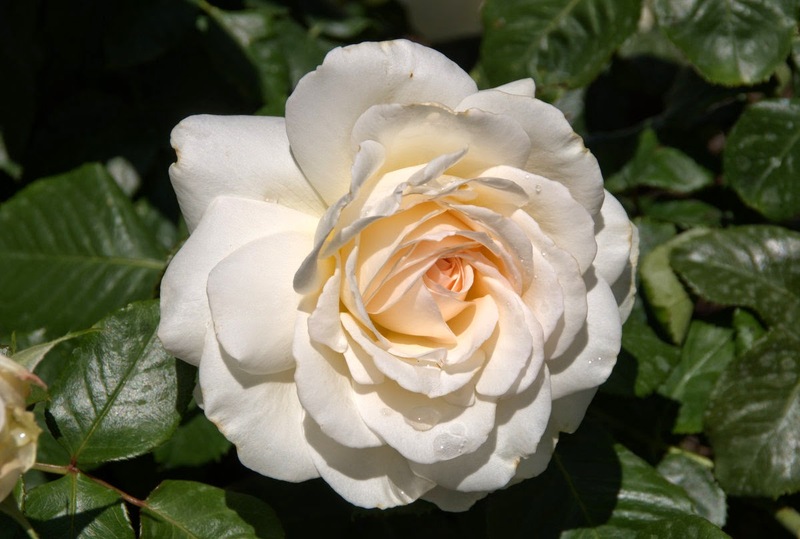 This is 'Auckland Metro', one of the roses in my white flowerbed behind the pool. I continue to be impressed by this young rose. 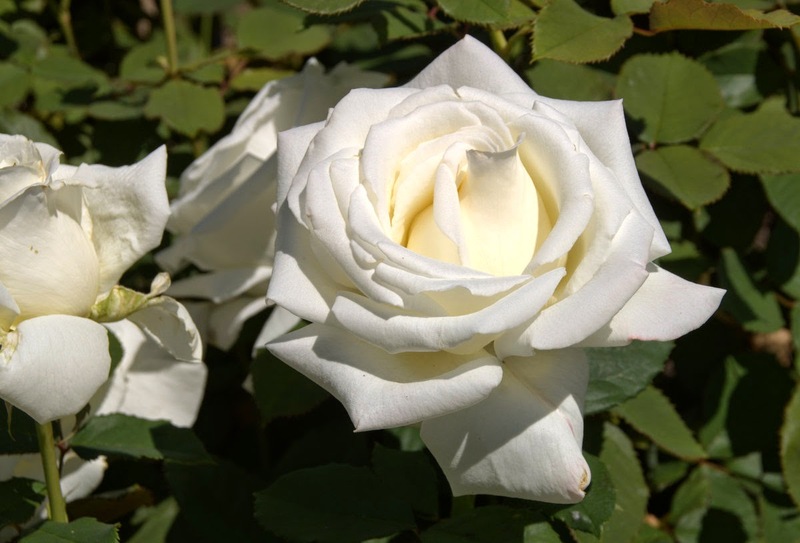 It repeats well, the blooms are of incredible beauty and elegance and, for a Hybrid Tea, it builds up a nice bush. I am looking forward to seeing it to get more established. Close-up of an 'Auckland Metro' bloom. Don't you just have to love it? 'Pope John Paul II', getting ready for his second flush. This is a rose that has proven itself for a few seasons in my garden now. 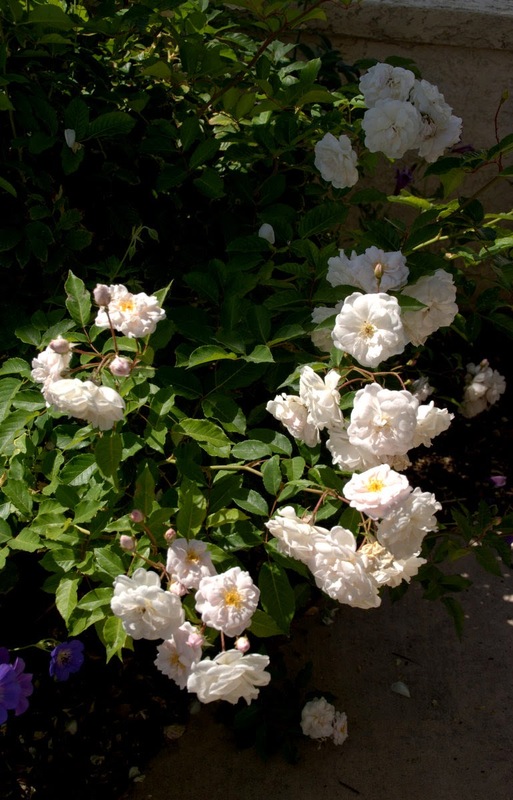 I think, it is one of the best white roses for a warm climate ever bred so far. The flowers of 'Pope John Paul II' are almost always perfect, I get plenty of them with each flush and they are good for cutting, which is also an important trait in a rose for me. Another rose that is growing in my 'White Garden Bed' is 'Chandos Beauty'. 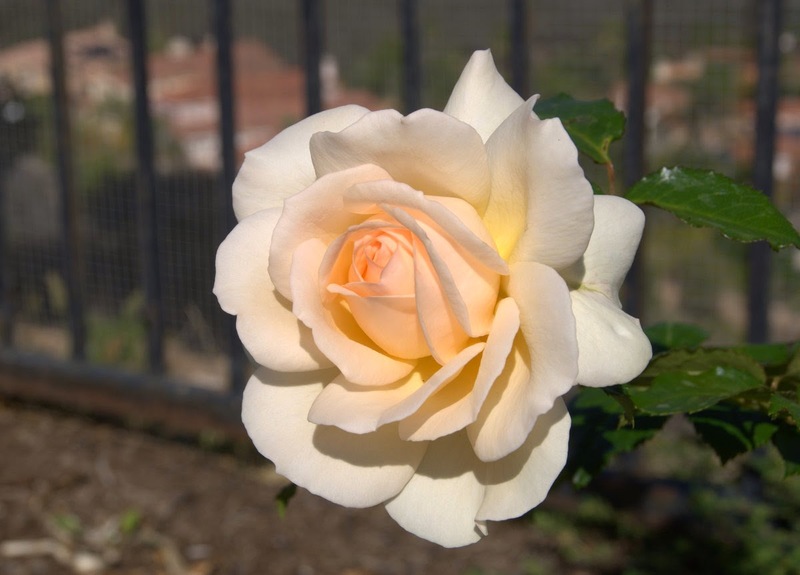 The blooms of this rose are also of great elegance in my eyes and they come with a very strong fragrance. I like the light apricot center and the flower shape. The bush itself though is quite leggy. 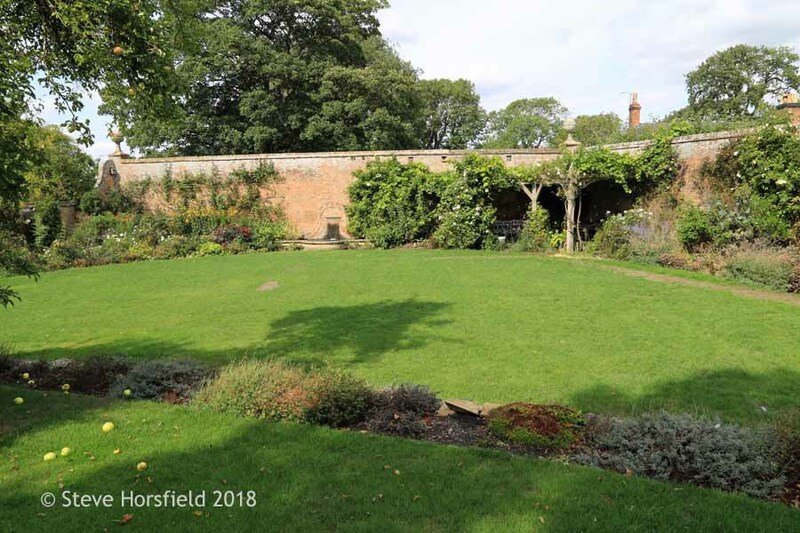 But it is still relatively new to my garden and in the process of getting established, so maybe the bush form becomes more harmonious over time. Even though it was already a bit tatty, I was pleased to see a bloom on 'Burnaby', another Hybrid Tea rose, when I came home from England. I almost lost this rose in the heat of summer last year, but it seems to recover and was even able to gift me with a flower. Yeah! ...the blooms are so pretty. I am very smitten by their particular shade of light pink color,..
...and that they have an aura of luxury and generosity around them. This rose could become a real standout in my garden, when it matures. Wishing all my American readers that you are having a happy Fourth of July weekend! See you in the garden! What a home coming you've had. Your roses are so gorgeous Christina. And they all look so healthy. Wow, wie grundverschieden doch die Vegetation bei euch von unserer ist. Deine Rosen sind wunderschön, ich wußte gar nicht, dass der Pabst eine eigene Rose hat. Immer wenn ich das englische Wort Pope lese, muss ich an einen Urlaub denken, in dem meine zwölfjährige Tochter mit Kamm auf dem Kopf ein T-Shirt trug: The pope smokes dope! Ich mußte immer so lachen. You are right Christina - north, south, east, west homes best, as the old saying goes. It was well worth paying to have your plants watered and cared for they look wonderful, especially Our Lady of Guadalupe complimented by Climbing Iceberg. Hope you had a lovely 4th July. Oh Christina ~ What a delight your roses are and I can just imagine how happy you were to see them doing so well. Your watering lady did a wonderful job while you were gone. I love Charles Darwin. Wow! I wouldn't mind having that in my own gardens. I'm glad the garden flourished while you were away. It looks so exotic to my eyes, the palm trees do it I think. Charles Darwin is a beautiful rose, I must have him I think! Getting someone to water your garden while you were away has made a huge difference and was well worth it. It's looking so lush, healthy, and you have so many blooms! Das ist wirklich beindruckend Deine Pracht zu sehen. Ich kann mir gut vorstellen wie schön es war in die Rosenblüte zu kommen. Habe ich das richtig gelesen vier Meter hohe Salvia? Aber ja, die Vegetation ist eben eine andere und es ist umso schöner Deinem Blog zu folgen! Liebe Grüße und hoffentlich konntest Du Dich gut erholen! I wish you a lovely summer! They are all perfect Christina. I've particularly fallen for R. Charles Darwin - I've not come across it in any of the nurseries or GCs I've visited. I must check out DA website. What a wonderful view from your front door, it must put a smile on your face each and every time you open it. Rose heaven ! they are all gorgeous, but I am in love with Charles darwin, and it is now officially on my wish list. Is it a good repeater ? 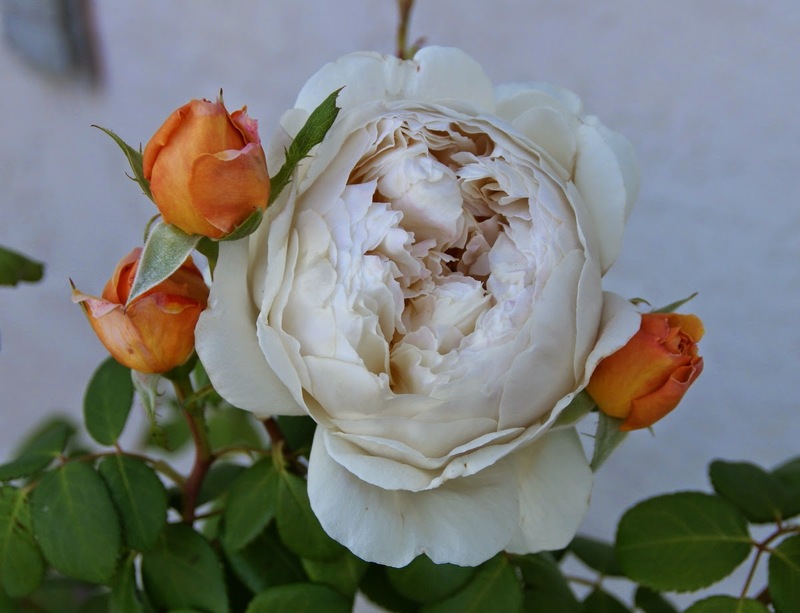 Jane, thanks, to answer your question: In my garden 'Charles Darwin' has a really good repeat. I am getting at least three flushes, more likely four in a year and they are all opulent! I definitively would recommend this rose! Of course it could be less happy and healthy in your climate, but I think it is worth a try. 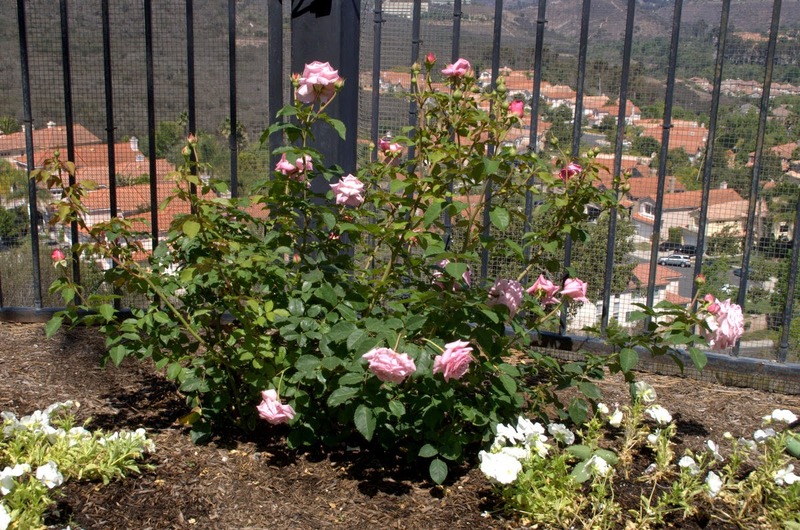 Christina, Your roses look so beautiful and healthy! After seeing the photos of 'Our Lady of Guadalupe', if I could find some space to squeeze that one in somewhere, I would! Simply gorgeous, although 'Mary Rose' has been one of my long time favorites. I hope you are enjoying some pleasant summer weather! 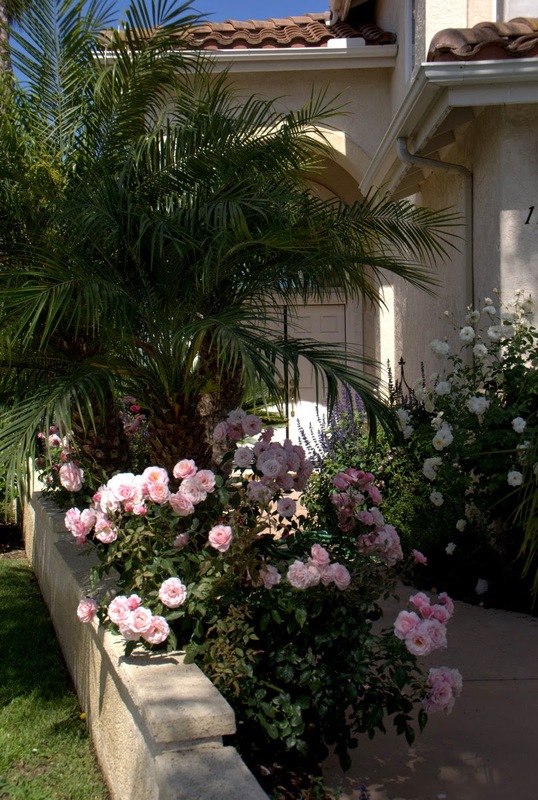 Hi Christina, lovely to see your garden again, and all the roses in full flush – can’t get enough of them! 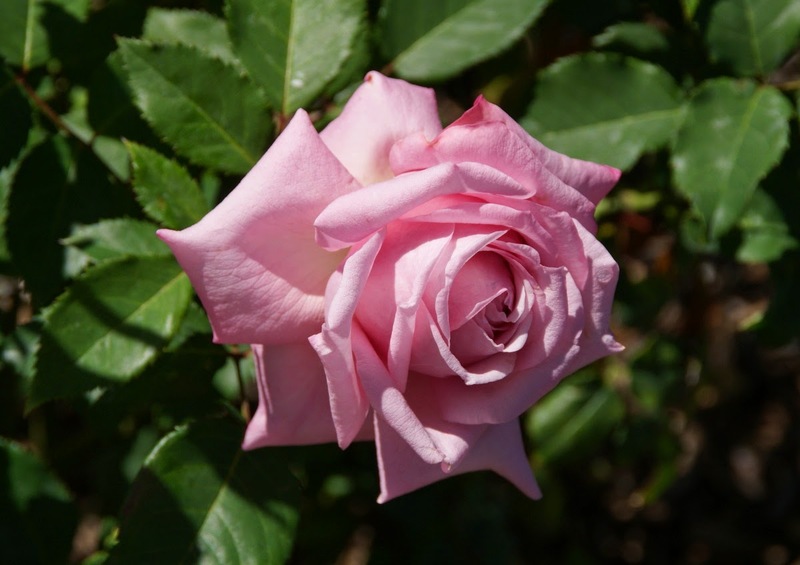 I love the 'Auckland Metro', it is a perfect rose in every sense, although not sure if you have said if it is scented, is it? For me a rose need to be scented to come close to perfection :-) But even completely unscented roses can be very high up on my list, just look at my dark red ‘Crimson Cascade’ , no scent but a very good rose in every other way. And 'Belinda's Dream' is a dream! Every time I see your roses I wish I had room for a few more in my garden! I hope you have a great week, take care, Helene. your roses ar stunning! Charles Darwin is like a dream! Wonderful! I don't think spring has ever left your garden! 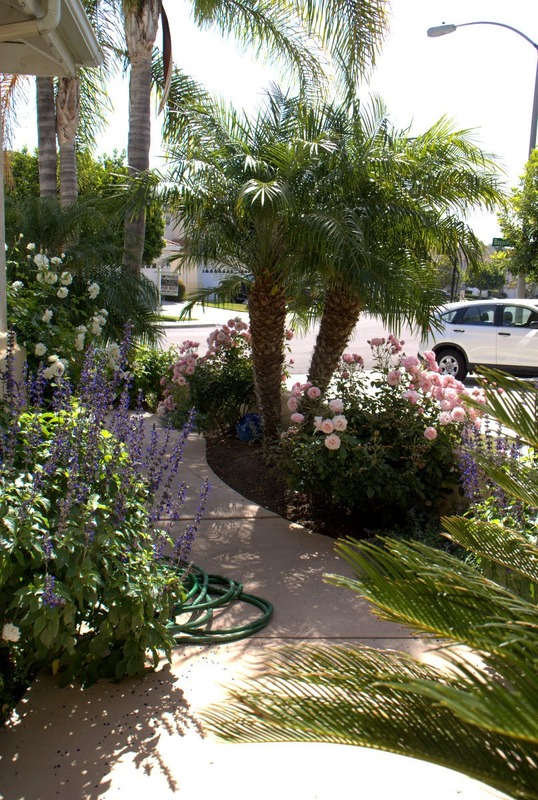 I love how your front yard looks, and the pot arrangement in the back. Iceberg is so lovely, and so is Belinda's Dream. ich bin immer wieder beeindruckt wie gut Deine Rosen im heißen Kalifornien gedeihen. Wenn wir hier mal eine kurze Hitzeperiode haben, sehen die Rosen gleich schlapp und blass aus. Deine Rosen sind wirklich eine Pracht! Die Charles Darwin gefällt mir auch sehr gut, sie wächst im Garten einer Freundin. Sie hat einen ganz besonders schönen Gelbton. Herrlich sieht es bei Euch aus, Ihr scheint eine tolle Aussicht von Eurem Grundstück zu haben. I envious of your roses. All so lush and floriferous. Ciao, bellissimo blog con bellissime immagini! Ti seguirò con piacere! was für eine herrliche Rosenpracht! I am so pleased to see your June Roses. They are all beautiful! I hope I can grow roses well like you do. Have a wonderful weekend! 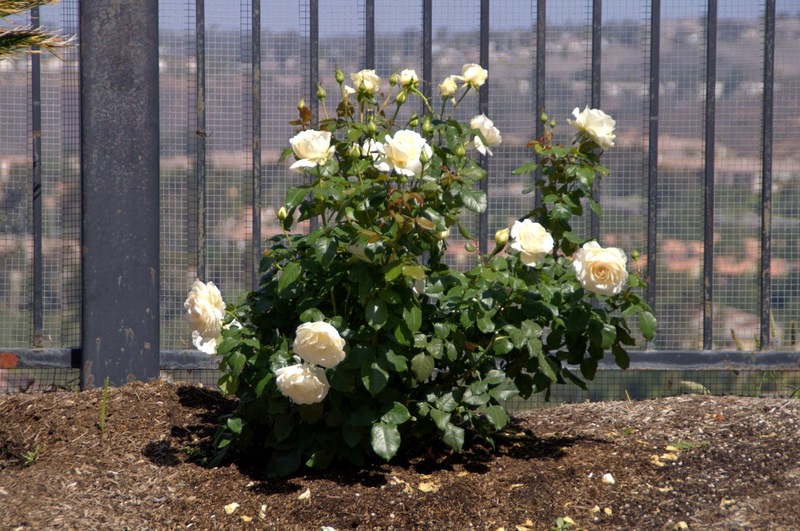 Here I would like to share my adventure and challenge of organic rose growing and gardening in our small suburban lot in San Diego, Southern California with you. I will write about private and public gardens that I visited close and far, too. Hope you enjoy reading it! Even as a young kid I was into plants and always wanted to garden and since 8 years I finally have my own yard to play with (two different gardens, though, because we moved). For 4 years now I am gardening in my current garden in San Diego, CA. My aim is to garden organically and in an environmentally friendly way honoring nature and all living beings. Roses hold a special place in my heart but I am interested in all plants! A SPRING INSPIRED FLOWER ARRANGEMENT FOR EASTER - Lidy creates a spring inspired flower arrangement just in time for Easter. HAPPY NEW YEAR - Wishing you and your family a very Happy New Year!! I love the old Victorian postcards with their nostalgic message!